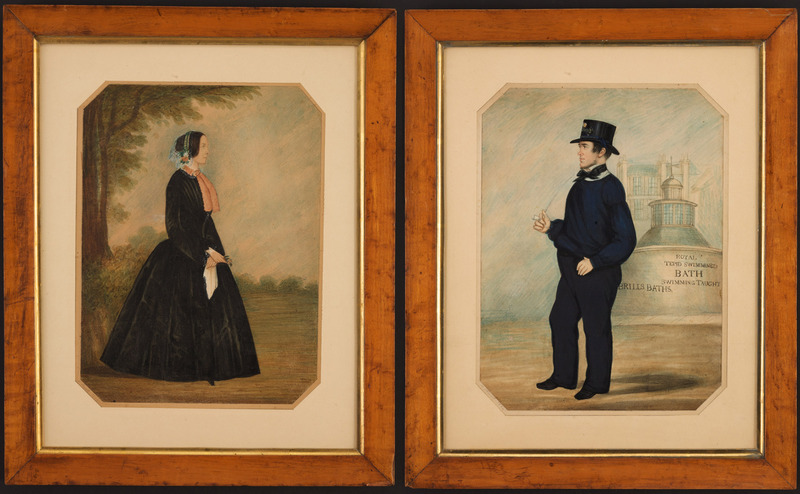 A pair of mid Victorian watercolour portraits of the swimming instructor from Brill's Baths and his wife. Signed and dated A. Stuart 1854 and within period bird's eye maple frames. When Brill's Baths were erected in 1869 a famous old inn in Pool Valley was removed. It was known as the 'Rising Sun', and was famous for hundreds of years as being the haunt of 'Old Strike-a-Light', a Sussex bogy man. There are records of baths being on this site back into the 18th century, Brills was closed around 1928 and demolished to make way for the Savoy Cinema.